Abner Mares made himself perfectly clear. As much as he wants an opportunity to avenge one of the two losses on his professional record, there’s only so much longer the WBA world featherweight champion will wait to fight Leo Santa Cruz again. 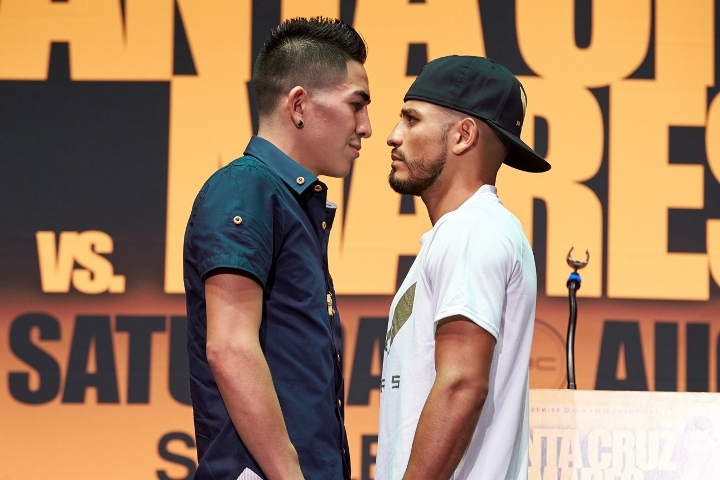 Their arrangement, to which Mares begrudgingly agreed, is that if Mares and Santa Cruz win their interim fights October 14 in Carson, California, their rematch will take place next. Richard Schaefer, who’s co-promoting the FOX doubleheader that’ll feature Mares and Santa Cruz in separate bouts, confirmed during a conference call Wednesday that handlers for Mares and Santa Cruz have informed him that their rematch will take place sometime in March in Los Angeles if they both win next week at StubHub Center. That’s fine by Mares, but if he seems skeptical, there’s good reason for his cynicism. He was supposed to face Santa Cruz again this Saturday at Staples Center, before Santa Cruz’s father/trainer, Jose, demanded a tune-up fight for his son before the Mares rematch. Jose Santa Cruz’s concern regarding his son fighting Mares coming off an eight-month layoff is the sole reason Leo Santa Cruz will face Chris Avalos and Mares will square off against Andres Gutierrez a week from Saturday night. If Mares and Santa Cruz win October 14 and Santa Cruz still won’t box Mares again, Mares made sure to mention an attractive Plan B, the very same matchup that could lure Santa Cruz away from their rematch even if Santa Cruz and Mares both win next week. If not Santa Cruz, Mares want to fight Carl Frampton next – the same Frampton with whom Santa Cruz split a pair of majority decisions in his past two fights. Santa Cruz out-boxed Frampton to win a majority decision in his last fight and won back the WBA “super” world featherweight title he lost to Frampton by majority decision nearly six months earlier. Northern Ireland’s Frampton (23-1, 14 KOs) also wants a rubber match with Santa Cruz. The former champion apparently would be willing to instead face Mares (30-2-1, 15 KOs), particularly if he can’t get Santa Cruz (33-1-1, 18 KOs) to travel to the United Kingdom for their third fight. Schaefer indeed knows what Mares is saying. That’s why Schaefer, who has worked with Mares on and off since Golden Boy Promotions signed him after Mares represented Mexico in at the 2004 Summer Olympics in Athens, reached out to Frank Warren, Frampton’s new promoter, recently to discuss a potential Mares-Frampton fight. “Abner is one of the most legendary and biggest names coming out of Mexico in the sport – period,” Schaefer said. “So Abner Mares is not gonna be sitting around and waiting around for anybody. And I really mean anybody. The fact is the 126-pound weight class is very deep. And, as a matter of fact, I talked to Frank Warren this week as well, and I know that Abner would be absolutely open to do a Frampton fight because that’s what he has told me. Mares isn’t just bothered because he was led to believe Santa Cruz would fight him next. The three-division champion also realizes that he has taken a tougher fight against Gutierrez, while his Southern California rival will take on an opponent who has been stopped in three of his past five fights. Avalos (27-5, 20 KOs) is coming off a technical knockout win against Houston’s Miguel Flores (21-2, 9 KOs) on July 18 in Alexandria, Louisiana. That result reads better than Avalos’ performance, though. Flores was winning that bout by the same margin on all three scorecards (48-46) when it was stopped and he had dropped Avalos in the third round. It was a cut near Flores’ left eye that caused a ringside physician to stop their fight following the fifth round. Avalos, of Lancaster, California, had lost three of his previous four fights by technical knockout, including a fifth-round TKO defeat to Frampton in February 2015. Santa Cruz recorded a close decision victory over Avalos when they were amateurs, thus they have some history. While Avalos has struggled in recent years, since Gutierrez (35-1-1, 25 KOs) turned pro in January 2009, he has dropped only a 12-round majority decision to fellow Mexican Cristian Mijares (57-8-2, 26 KOs) in June 2016. Gutierrez was supposed to fight Frampton on July 29 in Belfast, but Gutierrez fell in the shower after their weigh-in July 28, sustained cuts to his chin and nose and damaged two of his teeth. Those injuries forced Gutierrez to pull out of their fight and the entire card was canceled. Schaefer understands fans would rather see a Santa Cruz-Mares rematch right away, yet recognizes that Mares isn’t headed toward a tune-up fight. “It certainly has been a bit of a challenge because people are excited to see these two, Abner and Leo, fight each other again,” Schaefer said, referring to promoting the October 14 doubleheader. “But I have to say that these fights here – [Gutierrez] versus Abner, this is a real fight. This is not a soft touch or a tune-up. Abner knows that and he knows that [Gutierrez] is going to be coming to try to take what is his, what is Abner’s, the world title. I would prefer to see Mares fight Frampton next instead of LSC.